Electronic devices generate heat by themselves and in many cases they work in high temperature conditions. Overheating of electronic devices is one of the critical factors affecting device reliability and performance. Heat generated by electronic devices must be dissipated to improve reliability and prevent premature failure. Techniques for heat dissipation can include heatsinks and fans for air cooling, and other forms of computer cooling such as liquid cooling. Manufacturers of the electronic devices need to analyze heat generation and dissipation of electronic components, make decisions on their placement, necessary cooling devices, their placement and performance - this analysis is called thermal design and thermal management. Thermal design should be performed on the product's early design stage, together with reliability analysis. 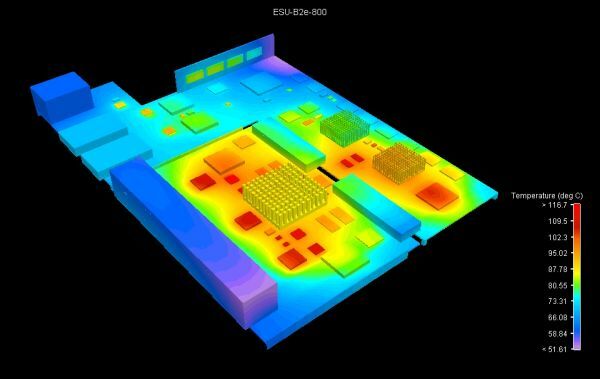 If it was not done, or if electronic components overheating is discovered during their manufacturing or field usage, thermal management can help and give answers on how to improve the situation - by determining how to change component placement, which cooling facilities to add and where. The best approach to thermal design and management is thermal modeling - simulation of airflows and heat transfer flows inside the system. Thermal modeling allows to estimate airflow and temperature distribution, determine size and number of the fans, accurately access influence of the configuration changes and failures of fans. We are using the FLOTHERM - powerful 3D computational fluid dynamics software that predicts airflow and heat transfer in and around electronic equipment, including the coupled effects of conduction, convection and radiation. It enables engineers to create virtual models of electronic equipment, perform thermal analysis, and test design modifications quickly and easily before any physical prototypes are built. ALD's thermal management team has been the dependable source of the thermal design for electronic systems services since ALD establishment. Our thermal experts combine deep knowledge of heat transfer and thermodynamics with sophisticated usage of the thermal analysis software. This combination ensures accuracy and innovation in the thermal management of the most complicated electronic project.